Most English people instinctively fear and dislike fungi, and waste no opportunity to kick a toadstool to bits. A native of the continent, especially of eastern Europe, would find such behaviour quite mad, and would no doubt add it to the long list of eccentricities for which we are internationally renowned. In all lands but this, wild fungi are gourmet fare. But here we eat only the insipid mushrooms that come in a safe plastic punnet, and leave the best to rot. Of all the hundreds of sorts of mushrooms and toadstools to be gathered from our fields and woods, only a few are dangerously poisonous. A large number will give you indigestion, even more are tough, tasteless, or otherwise inedible, but many of the rest are absolutely delicious. Unfortunately it takes detailed knowledge to decide which are safe to eat. There is no general rule, no substitute for knowing each species – and its lookalikes – well. In England we have no tradition of such learning passed down from parent to child. What knowledge we have must usually come from books. Overcoming this English phobia and finding wild mushrooms for the table often leads on to an interest in the fungi themselves. More than an interest: a fascination, an obsession. A walk in the woods becomes a treasure-hunt. The fungus-seeker’s eyes are rarely raised from the ground, unless it is to scan the boughs overhead for bracket growths. Fungi are now classified into their own kingdom, quite distinct from those of plants or animals. They are far stranger than any Martians. The range of forms and colours, of smells and textures and tastes, and of strategies for survival, shows a boundless cosmic imagination at work. The majority of the world’s 50,000 or more named fungi are microscopic. They have colonized almost every conceivable habitat, from pigeon droppings to the fuel tanks of Concorde. In a single teaspoonful of garden soil there may be as many as 2 million individual fungi existing either as spores or in active growth. All but the single-celled fungi are built to the same basic plan, being made up of hollow filaments called hyphae. The hyphae combine in a mass, the mycelium, which constitutes the body of the fungus. In a field mushroom, for example, the mycelium lies mostly underground as a network of threads; the mushrooms themselves are the fruiting bodies of the fungus and of course only appear at certain times when conditions for spore dispersal are favourable. A toadstool is a masterpiece of design, custom made for the job of spreading as many spores as possible. This it does in various ways, depending on the group to which it belongs. In the gill fungi, which includes many of the larger and more familiar mushrooms and toadstools, the gills are covered with tiny club-shaped projections called basidia. Each basidium carries four minute stalks, with a spore on the end of each one. A mushroom with a 10-centimetre wide cap has a gill area of some 1200 square centimetres. During an active life of 5 or 6 days, it will release something like 16,000 million spores – an average fall, day and night, of over 30,000 per second. Each of these spores is discharged in an ordered manner. Pressure is steadily increased at the point where the spore is attached to its stalk. The mechanism is not yet fully understood: but when the spore is discharged, it shoots away from the stalk to a distance of about 0.1 mm, or about 15 times its own length. Then, falling down between the gills, it is carried away on air currents. Even the lightest movement is enough to bear it away. The other three spores on each basidium are shot off at intervals of a minute or so. In order to achieve a free flow of spores, ripe basidia are evenly distributed among discharged ones and among those that are yet to fire. Both the stem and the cap respond to gravity, keeping the gills perpendicular to the ground and minimizing the chance of a spore sticking to an adjacent gill. The gills themselves are spaced and arranged for maximum efficiency. And, finally, most gill fungi take care to fruit in the autumn, when winds are strong, temperatures are right, and the weather is ideally damp. 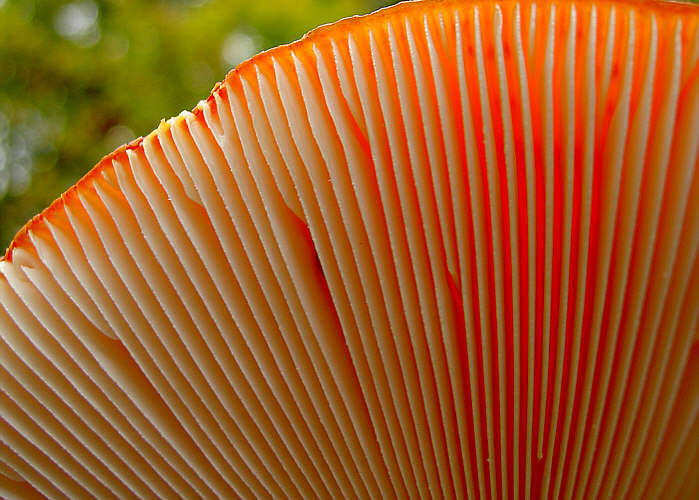 Unlike green plants, fungi have no chlorophyll and so cannot make their own food. They must get it from other sources. Some fungi are symbionts, growing on or in other living organisms (even other fungi); some are saprotrophic, feeding on dead material. Symbionts may be of benefit to the host, or may weaken and eventually kill it, in which case the fungus may itself die or switch to saprotrophy. The distinctions are not always clear-cut. The usual mode of feeding is via the hyphae, which ramify into a network invading the food source. Hyphae secrete chemicals which break down the food and allow it to be absorbed. The variety of things which fungi can use as food is staggering. Virtually any organic material – even the kerosene in Concorde’s tanks – can be grist to their mill. Without them, much of the decay in the world would be not happen and life for other forms would be difficult if not impossible. Most of the larger fungi belong to an advanced group called the basidiomycetes (those fungi having basidia), and it is usually with this group that an interest in, even a love for, fungi begins. The fungus fanatic could have no happier hunting-ground than Whippendell Wood, near Watford. The fungus flora there is so rich that during just a few visits I found well over 100 different species, and I would by no means call myself an expert. 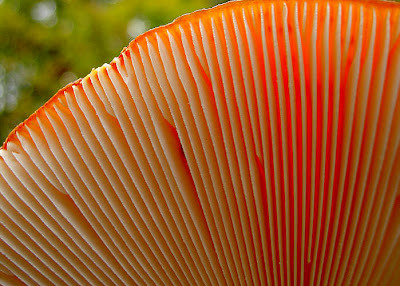 The commonest sort overall is one named Russula ochroleuca, with white stalk and gills and a yellowish cap, found growing singly or in small parties in the leaf litter under trees. Among the others are several of the most poisonous species known to man, and some of the most tasty. Next time you take a walk in the woods – and what better month for that than October? – spare a minute to look at some fungi. Even if you’re not sure of their names, you may find that the previously despised, overlooked, and, perhaps, kicked to bits, is admirable after all and, in its own peculiar way, both impressive and beautiful.